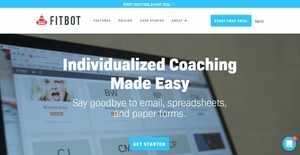 Fitbot is a web-based personal training software used by fitness trainers, strength coaches, and physical therapists to create individualized workouts for their clients, communicate with them, and track clients’ progress. Small gyms and studios can also benefit a lot from using the solution, as well as those users who conduct remote coaching. With Fitbot, personal trainers and coaches will be able to save time, as the software provides them with everything they need to train their clients in a single app. Thus, Fitbot permits them to focus more on their clients and less on the administrative aspect of their business by eliminating the dependency on phone calls, emails, texts, and spreadsheets. The personal training software also makes users generate more revenue because they can train clients remotely and supplement workouts during the week. Last but not the least, Fitbot helps trainers and coaches stay organized so they can make their customers more engaged and increase customer satisfaction and retention. One of the reliable features offered by Fitbot is how it keeps customers and clients engaged while they undergo trainings and workouts. They will be able to easily log and record workouts, as well as track their workout history through the software. In Fitbot, clients can watch exercise demo videos that are embedded on emails. Once they completed their workout, they can post workout details, questions, or diet-related concerns that trainers can quickly access from a web browser. Some fitness and coaching businesses still rely on phone calls, emails, and text messages when it comes to communicating with their clients. In effect, emails, voicemails, and text messages are sometimes accidentally deleted or difficult to search. Fitbot removes this type of communication approach by allowing coaches and trainers to do all these things on one app. This means they will be able to contact their clients by sending emails and text messages, and making phone calls directly from Fitbot. Furthermore, all messages are delivered in real time. Creating workout programs and plans within Fitbot is a breeze. This is because the software is designed with a workout builder which enables trainers and coaches to easily prepare individualized workouts for their clients. Also, it has an exercise library where they can access pre-built workout templates they can use in designing workout programs and plans. In case they want to create their own workouts from scratch, they can also do that. Fitbot lets users monitor the workout activities and progress of their clients on a daily basis or for a specified period of time. They will be able to immediately capture and track clients’ data. Given the fact that workout routines and exercises can produce changes over time, it is very important for users and their clients to check these changes as they happen. Through the aid of Fitbot’s robust visualization tool, both trainers and clients can see the progress they are making over time. Lastly, Fitbot permits trainers and coaches to set up how often they want to receive notifications about new activities. The software allows them to configure rules for notification. This way, they are ensured that they will always be updated and alerted on important matters related to their business without the need of bombarding their inbox. Each business has its own characteristics, and may need a special Learning Management System - LMS solution that will be adjusted to their company size, type of customers and employees and even individual industry they deal with. You should not count on getting an ideal app that is going to work for every company no matter what their history is. It may be a good idea to read a few Fitbot reviews first and even then you should remember what the service is supposed to do for your business and your workers. Do you require a simple and straightforward solution with just basic features? Will you really use the complex functionalities needed by experts and large enterprises? Are there any specific features that are especially practical for the industry you operate in? If you ask yourself these questions it is going to be much easier to find a trustworthy app that will fit your budget. How Much Does Fitbot Cost? We realize that when you make a decision to buy Talent Management Software it’s important not only to see how experts evaluate it in their reviews, but also to find out if the real people and companies that buy it are actually satisfied with the product. That’s why we’ve created our behavior-based Customer Satisfaction Algorithm™ that gathers customer reviews, comments and Fitbot reviews across a wide range of social media sites. The data is then presented in an easy to digest form showing how many people had positive and negative experience with Fitbot. With that information at hand you should be equipped to make an informed buying decision that you won’t regret. What are Fitbot pricing details? What integrations are available for Fitbot? Fitbot supports partnership with Opex and Central Athlete.